Mobile phones have brought fun and convenience to people in modern times, and you can do many things with a phone, such as watching movies, playing games, taking pictures, etc. However, some experts said that “mobile phones are destroying family life”, and you may have already sensed it. Do we have any way to change this situation? The answer is yes. To make you and your family members enjoy family life without abandoning mobile phones, you can mirror your phone to TV and enjoy music, films, gameplay and other activities you do on your phone together with your family. If you have a Samsung TV, then you can refer to this article to find free and paid ways to mirror Android screen to Samsung TV. The first tool that comes in handy is Samsung Smart View. This is a mobile application that allows you to connect your smartphone or tablet on your Samsung Smart TV wirelessly. You can use it if you want to watch your saved movies or video clips on a bigger screen. Besides, it also can be used to project powerpoint presentations or documents if you have a file reader on your phone. The best feature of Samsung Smart View is its “TV remote control feature” which enables their mobile devices to serve as a remote control. 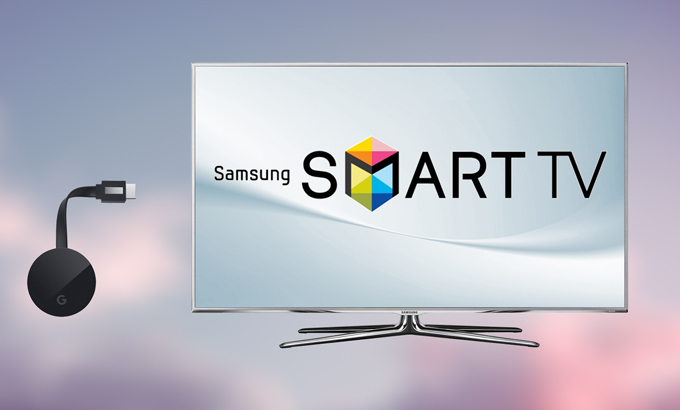 To learn how to mirror Android to Samsung TV using this app, you can follow the steps below. 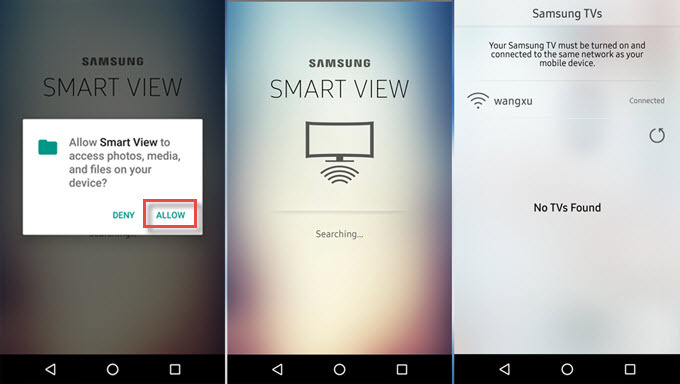 Go to Google Play Store, download and install Samsung Smart View on your Android device. Afterward, launch the app then tap “Connect to TV”. Tap the icon with your TV’s name on it. Then on your TV, select “Allow” on the pop-up window to connect your mobile device. You have to make sure that both devices are connected to the same Wi-Fi network. Once connected, you can select media files on your Android phone and enjoy watching it on your Samsung TV. Another way to cast Android screen to Samsung TV is using Chromecast. 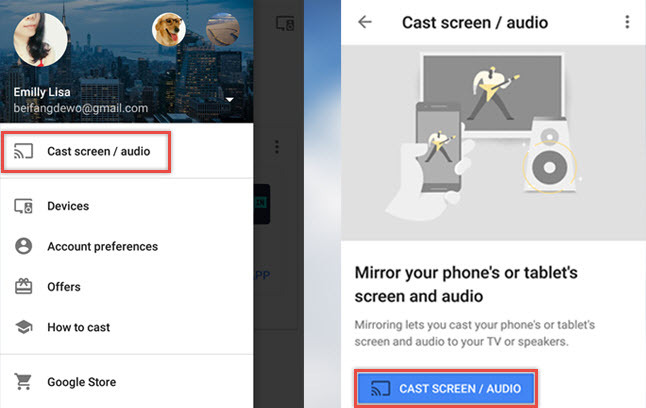 Chromecast is an affordable device capable of casting your Android device to TV when you are streaming cast-enabled websites such as YouTube, Dailymotion, Facebook, Netflix, Viki, Spotify, and Fox Sports. Aside from Android devices, it also works on iOS, Mac and Windows devices. The downside of this device is it doesn’t support 4K streaming. If you want to watch 4K content shows, you may need to purchase Chromecast Ultra instead. Here are the steps to cast your Android device on Samsung TV using Chromecast. Plug Chromecast into your TV, then connect the USB power cable to your Chromecast. Install Google Home on your Android device. Connect your Android phone and TV on the same Wi-Fi connection. Open Google Home then tap the “Menu” icon, and select “Cast Screen/Audio”. Now hit the “Cast Screen/Audio” icon to scan nearby devices. Once your TV has been detected, select the device to start mirroring. Then you’ll see your phone screen on your TV immediately. Screen mirroring Android to Samsung TV can also be done with the use of MHL (Mobile High-definition Link). 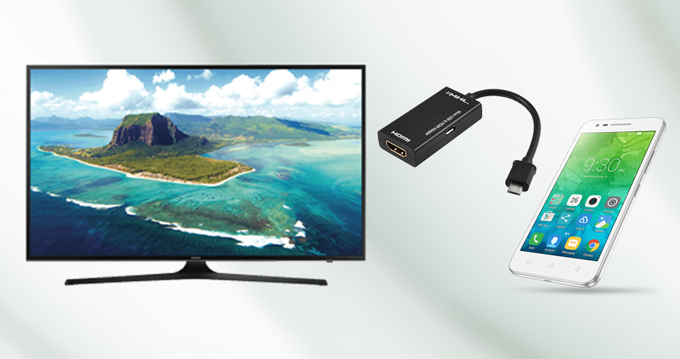 This adapter has the ability to connect and mirror Android phone and tablet to high-definition televisions along with HDMI cable. The advantage of it to the previous solutions is that it doesn’t necessarily need an internet connection to work and it offers better quality. Below are the steps to connect your Android to Samsung TV with MHL. Connect the MHL adapter with HDMI cable on your Android device. Now, connect the opposite end of the HDMI cable on your TV. Lastly, go to the settings of your TV then locate your plugged device. Then you can access files saved in your Android. 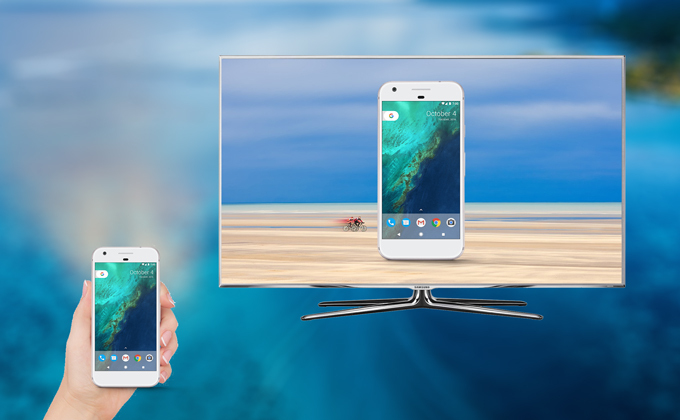 With the introduced solutions you can now effortlessly mirror Android to Samsung Smart TV. To sum it up, all these tools are helpful. If you are looking for a lightweight and convenient application, select Samsung Smart View. Meanwhile, if you need a versatile and easy to set up tool, Chromecast perfectly fits on your preferences. If you don’t have a stable internet connection, I highly recommend mirroring your device with MHL. Furthermore, if you are also looking for an app to share your Android screen with PC, then try Apowersoft Android Recorder. It allows you to mirror your phone to your computer and record your phone screen without any hassle.